All Out Effort Blog: Why You Should Or Shouldn't Be Here? Why You Should Or Shouldn't Be Here? Over 150 people contacted us about training since January. We have taken 4 people so far. That means making the right fit is that important and is something both the client and the coaches have to feel right about. It's ultimately a collaboration and there are things required of us, and there are things required of the client. We will provide the bat, you have to be the one to swing it. It's 50/50. If you hate exercise, hate being in the gym, hate waking up early, hate how inconvenient being healthy is, I don't know how we can help you. We won't take anyone unless we feel its the right thing for them. It's not about the money, it's about making changes. And a lot of people contact us who don't want to change. They are just looking for training. They tell us what kind of training they like and just want to know if we can deliver that. If change isn't important for you, then we are probably not what you are looking for. We are facilitators of change. We are coaches. Coaches change people, trainers just train you the way you want to be trained. There is a difference. We can refer you to trainers. This town is full of them. If you want to train with us, you should know why you want to train with us. What you want to change, why you want to change. If we just took everyone, so many people would just be coming in to spin in a wheel and not change, and pay us for it. That's not what we are about and I would feel out of principle uneasy about taking that client who's paying us so they can do nothing differently. We aren't about the trainers. We are about our program. If accepted this program could possibly change everything about your health. Do you want to go to Stanford just because its a prestigious school or do you want to go there because you thought it would change your whole future if you got into their business program or law program? They too probably only want to take people who want to be there, not because they think they have to be there. Same with us. We only want people who want to be there because they think this could somehow improve their life. Not people who think they need to be there because they heard we are the best in town. You don't pick a school because of you heard the teachers teach in the style you like, you go there because they have a great program. This is the same in the sports world, music world, companies, and it SHOULD be like that in personal training. Why are you here, is the question I will constantly be asking. You don't always need to know the answer, but its something you need to think about. The day you don't know what else there is to gain is the day you no longer need us. In a way The Karate Kid screwed the world. It made people think you find the right guru and train with him for 6 months, you can beat people who have trained their whole lives. Take the right pill, find the right DVD, meet the right trainer, and in 6 months you can look like someone who's taken their whole life to cultivate their body. We've taken hard work and dedication out of the whole picture. That's just nonsense. Hard work and dedication will always be a part of it and finding the right trainer will never eliminate that. And huge change like that takes time. You need to first move well, then we can have you move a lot. Once we have you move a lot, we can make a big engine. Once we make a big engine, we can now use it to burn off a lot of excess fuel. If you don't go in this order, you will be have temporary results if any results at all, and a series of injuries. And a general sense of never feeling athletic. You find the right program and put dedication and hard work into it and that's when the magic happens. But you have to believe, you have to know why, and you have to make a leap of faith. You have to do all the little things. That's the only way to be sustainable. If you hate everything and are generally unhappy, but still want to look good for vanity's sake, there are some personal work you have to do before we could ever be in a position to help you. You are not in a position to be helped by us, I'm sorry. We are coaches who deal in fitness and compassion, but we aren't therapists or spiritual leaders or your parents or significant others. A lot of people try things out with a, "let me try this out and see if it works" attitude. With that attitude, it will never work. Not only that, whatever you try, so much time will be spent trying to convince you that it works and impress you so you can keep paying them, you will never get any sustainable results. We will never waste your time or ours trying to impress you. 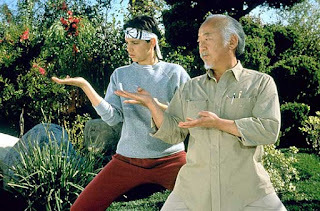 One thing I did like about Mr Miyagi is when he said "Either you karate do, yes or karate do, no." No I guess.